Have you ever been in public and told your child to apologize to another child, only to see your son or daughter’s lips tighten all the more? Uncomfortable, isn’t it? In those moments, we stand there, helpless and, mortified. In our home, the need for forgiveness is as common as mealtimes. The cycle of offense and forgiveness is one we rotate through regularly, whether between siblings or parents. I want my kids to apologize when they have wronged someone, but not at the cost of cheapening contrition. Do we want meaningless apologies that devalue our relationships or sincere repentance that enhances them? When it comes to forgiveness in our house, I’m not satisfied with empty externals. I want our relationships to be stronger in the aftermath of our struggles. The goal of an apology in every family should be to restore and bring healing through forgiveness. It is to make amends by mending that which has unraveled—the bond of trust, peaceful spirits, and righting wrongs. Being ready to apologize or forgive is not an automatic state of being in the aftermath of conflict. It can take time, but it is far better to allow for breathing room than forcing an insincere apology or sweeping problems under the rug. Sometimes, the guilty party is ready to ask for forgiveness, but the wounded sibling isn’t quite available emotionally to offer it. In both cases, parents would do well to coach them toward harmonious reconciliation instead of a hasty reparation. I let them mull that over, praying that the Holy Spirit will prompt them and work in their hearts. Just today, one of my youngest kids had a terrible meltdown over pizza. Pretty ridiculous, right? Well, it wasn’t ridiculous to him. And he let his father know it by messing up his bedroom and being disrespectful. My wonderful husband kept calm, giving our son space to simmer down before speaking to him about right responses and better ways to manage disappointment. As our little guy came around, playing with his Legos, I sidled up to him and gently planted the idea of mending his relationship with his dad. He immediately ran to his father, wrapped his arms around him and said those two little words we love to hear, “I’m sorry.” He meant it. Instead of an angry glare, his face was softened and his eyes were full of longing. He tilted his head up, eager for his dad’s embrace. This became a truly teachable moment. Only then was our son open to listening. As a result, they got to practice more appropriate ways to communicate in the future. 2. Take ownership for your sinfulness. Apologize without any explanation for what you did or reasoning behind your behavior except for the sin that it was. (Explanations are usually justifications for wrong behavior that are not true apologies. This leads to further disagreements.) Your goal should be to take ownership for your own part in the argument or circumstance, not to focus on their behavior or sinfulness. 3. Do not expect to get an apology back. We teach our children that we can only control and manage our own hearts through the Holy Spirit’s help. Similar to Wendy’s simple script in chapter 23, “You do you,” we can’t control anyone else’s forgiving heart but our own. When we want to restore our relationships, we must apologize and pray that our sibling or spouse will be receptive to our apology and that the relationship will be restored, but we can’t go into it counting on that to happen. Otherwise, we will become angry again instead of simply meeting our goal to make things right on our end. However, we do teach our children that if someone apologizes to you, the right thing to do is indeed to forgive them! We want them to be able to say, “Thank you for your apology. I love you and I forgive you.” Often, this prompts a similar apology from the other person. Honestly, it’s embarrassing if our child wrongs another and they don’t want to make it right. We want to force an apology so we can have peace in our home and peace of mind. However, we trade a real opportunity to shape their character for a false sense of resolution. We have to get comfortable with the discomfort of not having immediate closure. Forgiven people are forgiving people. I’m convinced that the quality of a forgiving spirit is one of the ways we can raise kids to live counter-culturally, winning others to Christ. Moreover, if our children learn to both forgive and accept forgiveness, they become adults who navigate their faith walk unburdened by the weight of sin, free to live life to the fullest as God intended. 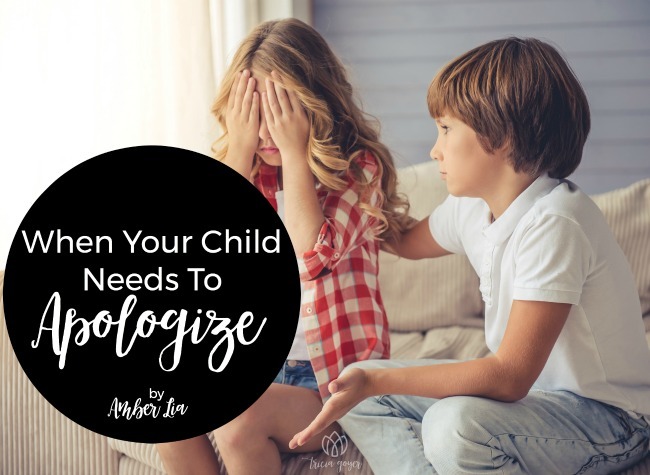 There may be areas I look back on as a mom with regret, but I’m certain when it comes to not requiring my kids to fake it in the forgiveness department, I’ll be unapologetic. 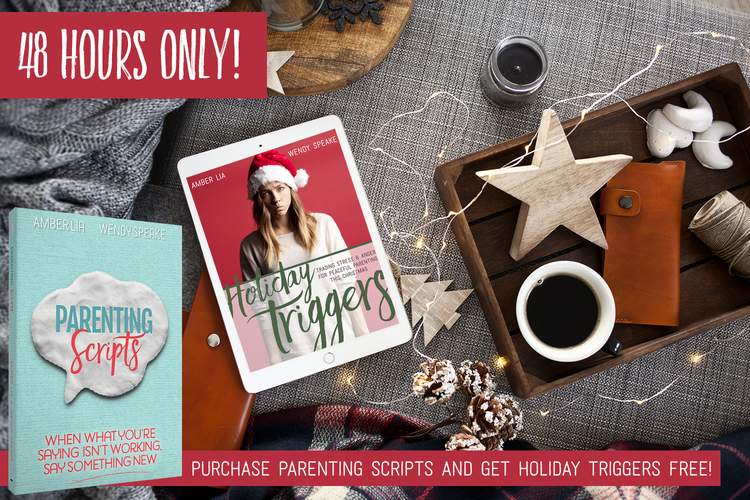 Purchase a copy of Parenting Scripts and email your receipt to amber@motherofknights.com and you’ll receive a free pdf copy of Holiday Triggers! Your purchase and email must fall between 12:00am on 11/27/17 and 11:59pm on 11/28/17 to qualify for the BOGO offer! You’ll receive your copy of Holiday Triggers within 48 hours! Parents want to say and do the right thing in the heat of the moment, they just aren’t sure what that looks like. Parenting Scripts is the much needed resource and encouragement for moms and dads desperate to speak life to their children, instead of defaulting to the same old words and ineffective consequences. Focusing on the most ordinary and yet troublesome areas in our daily routines, Parenting Scripts helps parents to craft intentional, well thought out and prayed over words. A former high school English teacher, Amber Lia is a work-at-home mom of four little boys under the age of ten. She and her husband, Guy, own Storehouse Media Group, a faith and family-friendly TV and Film production company in Los Angeles, CA. 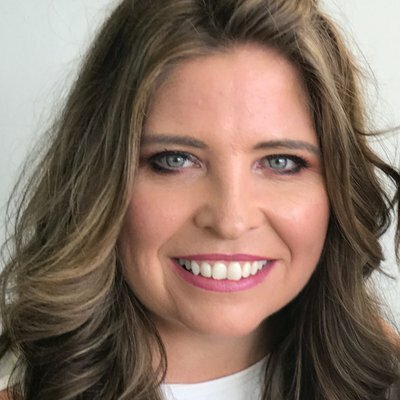 When she’s not building sand castles with her boys on the beach, or searching for Nerf darts all over her house, you can find Amber writing to encourage families on her blog at Mother of Knights (www.motherofknights.com). And be sure to check out her first book, Triggers: Exchanging Parents’ Angry Reactions for Gentle Biblical Responses! Totally agree with this wonderful article that I read with great curiosity and interest! Very good !